Cooking is an art, they say. But cooking at lightning speed is real art. Smoked grills and barbecue dishes may suit weekends and backyard parties, but everyday cooking needs are totally different. Every one of us faces the reality when we have to cook on our own. Even if you have somebody to cook for you, preparing fried food takes more time. Another important aspect is that oily foods are bad for health. It increases the unwanted fat in your body, it is very dangerous in the long term. But we can’t help it when the mind-boggling smell of fried chicken hits your nose. What’s the escape then?. Air Fryers are the best thing to tackle your taste cravings, Air fryers cook fried foods without oil. Which means, literally you will be able to enjoy the fried foods without the health risk. Ninja Air Fryer is one of the competent Air Fryer that takes on the rivals in the market. Not only that, it is more efficient, compact and reasonably priced among other top rated Air fryers. Let’s see what is has to offer. How Ninja Air Fryer Looks? How Does Ninja Air Fryer Works? What Type of foods that can be cooked? 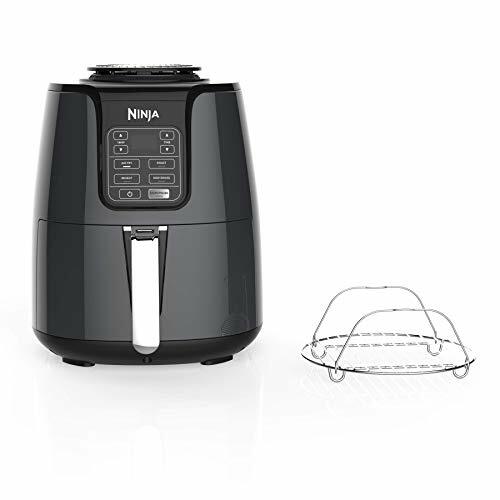 Ninja Air fryer gives a solid look, made with the best quality materials. Precise cutting edge constructions make this one of the long lasting Air Fryer. You can choose a black or Grey color. In my opinion, Black looks more stylish, Grey looks more formal. Cost of both colors are the same. The display and control panel is positioned on the front side of the Air Fryer, simply easy to operate when you place it on the counter. One touch control panel and small display fits with the design. This Air Fryer is the most compact in this size range, which means less bulky and convenient than other similar capacity Air fryers. Ninja Air Fryer is a simple device, absolutely easy to pass the learning curve. It is easier to use for even somebody who never used an air fryer. It offers 4 modes if you want to do a quick setting for roasting, or just take the most out of your food. Also, reheating setting help you get a moderate heat to quickly reheat the food cooked hours ago to serve hot. Air Fry is the regular use button, where you will have to adjust the temperature and time settings depending on the cooking needs. While air frying or reheating, it is best to shake the fryer basket a few times in between will help to get the food get even heat throughout. But, it depends on what you are cooking. Example, shaking the pot would be effective while cooking frozen french fries. A single piece of chicken wing won’t need the shake. High powered processor fries the food with heated air, thus it doesn’t need oil. Little oil may be needed for a few varieties. But at the end of the day, this Air fryer reduces the total amount of fat content you consume. Not at all, just like any other Air fryer, ninja offers the benefit of easy handling. Using this Air fryer helps in reducing the cooking time by half. The 4qt capacity is sufficient for a 6 member family if you are frying appetizers and french fries. The removable parts in this Air fryer are all dishwasher – safe, so you don’t have to sweat it. Simply remove the cooking pot and the tray to put it in your dishwasher. Apart from that, the basket and the tray is ceramic coated and non-stick. If you are cooking light foods, then you can just wipe with a paper towel to clean up. Let me first start with what is not possible, grilled foods are not possible. Boiling is not possible. You can roast, reheat, air-fry and remove the moisture from foods. This air fryer is a great choice for people who love eating chicken wings, salmons, sweet potatoes, french fries, toasted food varieties, nuggets and so on. Ninja Air fryer can get the job quick and easy with its mighty 1550watts power and efficient processor. Smart Processor: Frying, heating, dehydrating and toasting with the high-temperature air, it makes the process effective by its precisely built processor. Ninja Air fryers’ Smart processor is one of the quickest and accurate. Heat settings and temperature control: 4 Preset heat settings in this Air fryer allows the user to make it fast, reheat, air fry, roast or dehydrate settings can be set based on the requirement. Temperature and time adjustments help in getting the foods properly cooked. Temperature levels of this Air fryer are capped between 100 to 400, you can use the maximum temperature level to cook hard foods like turkey wings. While cooking less hard foods, higher levels of heat in this Air fryer helps in faster cooking. Convenient and compact design: The wide base of this Air fryer has very less to no chance of slippery. With a large cooking basket and 1550W power, this is one of the compact and convenient options among top rated air fryers. Multi-layer Rack: while dehydrating fruits, veggies, and other ingredients, a multi-layer rack offers more space and makes the whole job simple and quick. Cleaning and Maintenance: Cooking basket, tray, and multi-level rack are dishwasher safe, hence, cleaning and maintenance is never a problem with ninja Air fryer. Conclusion: Bigger is not always better, but ninja Air fryer is bigger yet better. The capacity and the power is designed focusing on the needs of the whole family. Cooking is efficient and easy with this Air fryer. Not to mention, with all these features and specs, the cost of this Air fryer is pretty reasonable and cheaper than most of its competitors. Best suitable for families who are leading a hectic schedule, easiest and fastest cooking helps people not to miss their breakfast. Above all, the varieties that can be cooked with ninja Air fryer is the favorite of most people in the globe.